Remains of a shell dropped on the wall of an old fortress at the entrance to Askeran town more than 20 years ago, during the 1988-1994 war between Nagorno Karabakh and Azerbaijan. Vladimir Avetisyan, 23, travels from Gyumri to his military post in Aghdam, at the frontline between Nagorno Karabakh and Azerbaijan. 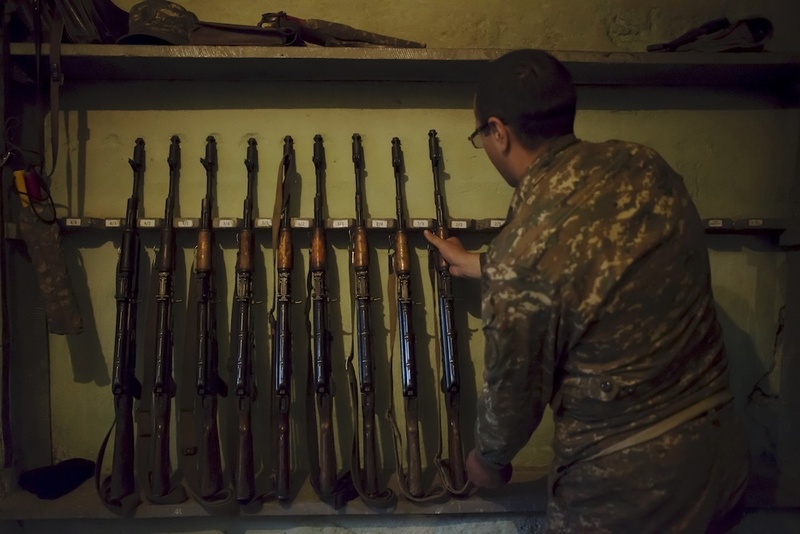 He was urgently called back from holidays in his hometown, as clashes between Karabakh and Azerbaijan escalated on the night of April 1-2, 2016. 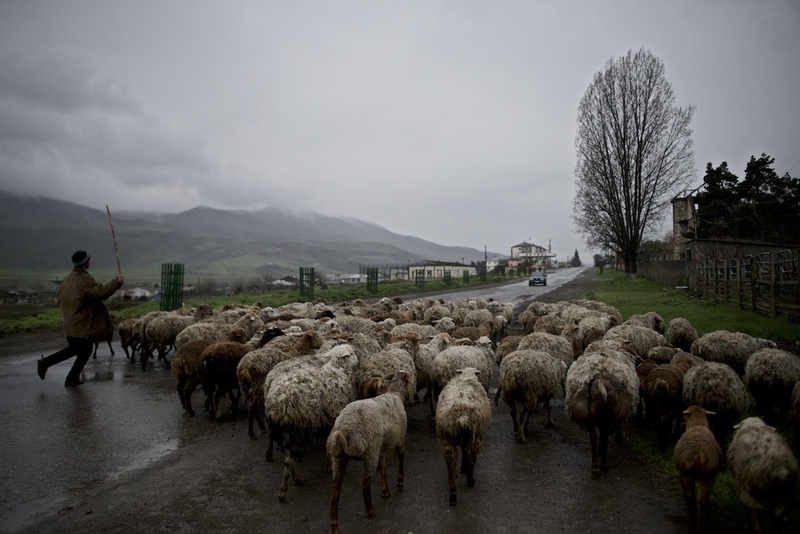 Shepherd who normally takes his sheep to Aghdam, at the border with Azerbaijan, now moves them to overnight at a safer location, farther from the frontline. 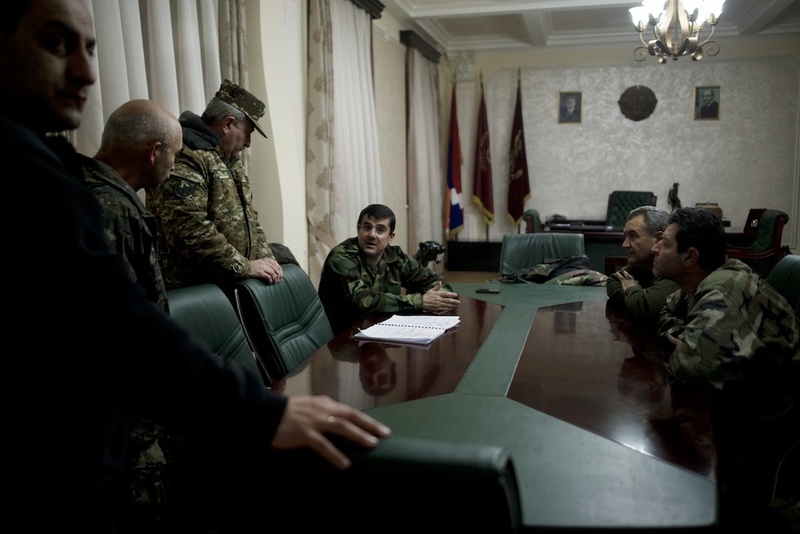 Nagorno Karabakh Prime Minister Arayik Harutyunyan is in discussions with his team, ahead of a meeting with volunteer fighters arriving to Stepanakert from different locations in Karabakh and Armenia. 1988-1994 Nagorno Karabakh war veterans and younger generations arrive to Stepanakert to voluntarily fight at the frontline. Rain covers the grave of a soldier killed in the Karabakh war, in the memorial cemetery of Stepanakert, capital of Nagorno Karabakh. 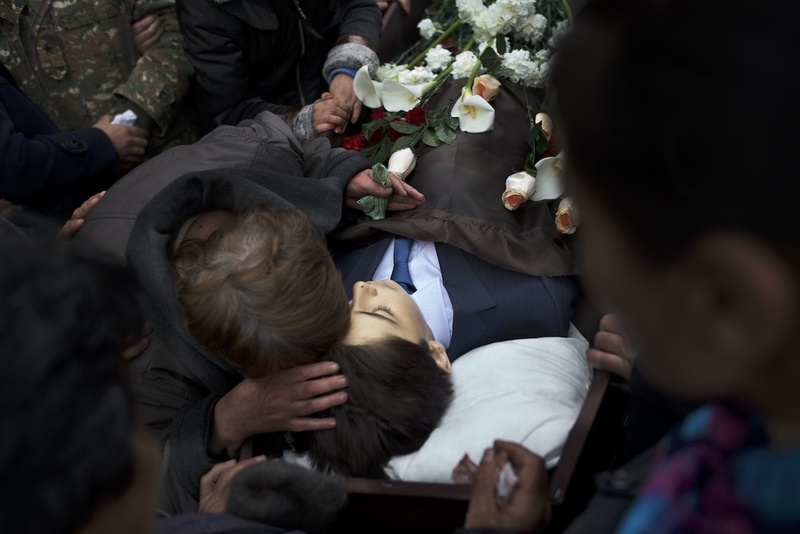 Family grieves the death of Vagharshak Grigoryan,12, who was killed in shelling that hit his school in the Martuni region at 8:30 AM, April 2. The child was one of the four civilians killed as a result of the re-ignited conflict between April 1 and April 5. 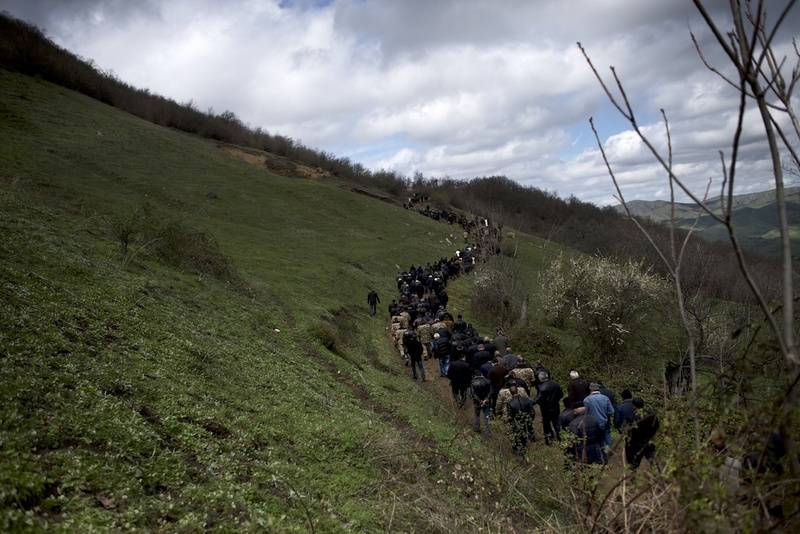 People walk up a mountain in Herher village during the burial ceremony of Vagharshak Grigoryan,12, who was one of the four civilians killed as a result of the re-ignited conflict between April 1 and April 5. 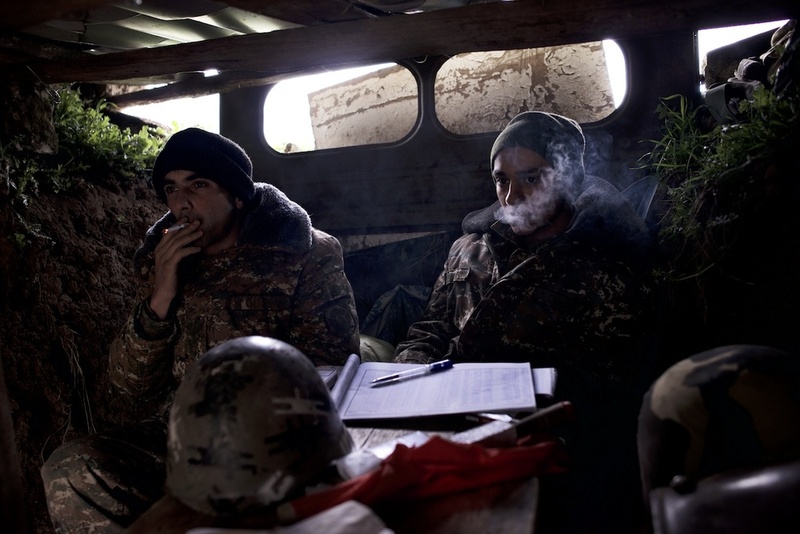 Lieutenant Vahe Avanesyan, 27, and soldier Harut Gasparyan,19, in a trench at a frontline post after an order to hide, during military operations at the frontline on April 4. Trail leading to one of the settlements between Stepanakert and the Azerbaijan border. Long-time driver of a military official, Davit Gasparyan, 36, was killed while at a frontline post in the evening of April 4. He left behind a wife and three children. Father of killed military driver Davit Gasparyan, Yuri Gasparyan, 63, worked in Stepanakert during the Nagorno Karabakh war more than 20 years ago, while the city was being shelled. An area in Karabakh, which people call Whore's Fishnet Stockings, is 30 meters apart from the Azerbaijani border. Bloody battles took place here in 1994, where shells left crossing marks, resembling fishnet stockings. The area is still a dangerous zone, and cars drive fast through it. A shell exploded on a road entering the Talish frontline village, on the night of April 3rd to 4th, killing several volunteer fighters standing next to the shelled car. The wedding hall in Talish was one of the most affected buildings, with almost all its ceiling destroyed. 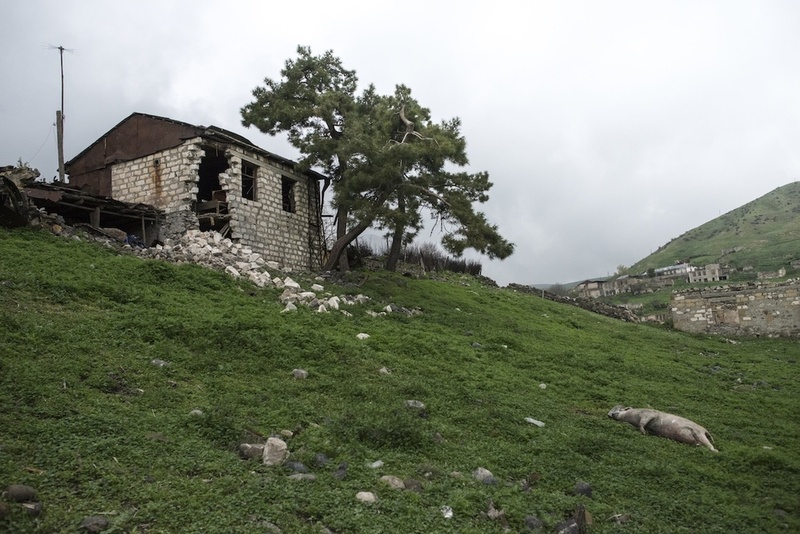 The house of Hermine Sahakyan, 30, and her family in Talish village, was hit twice during the five-day war. Shelling destroyed her children’s bedroom on April 2, and another one ruined the living room on April 5. The family escaped the house in the night of April 2, several hours before the first shell hit it. With furniture and toys covered with dirt and dust, one of the destroyed houses in the Talish village belongs to the Sahakyan family. The parents with three children and their grandmother, escaped the house the night when shootings began in the direction of the village. 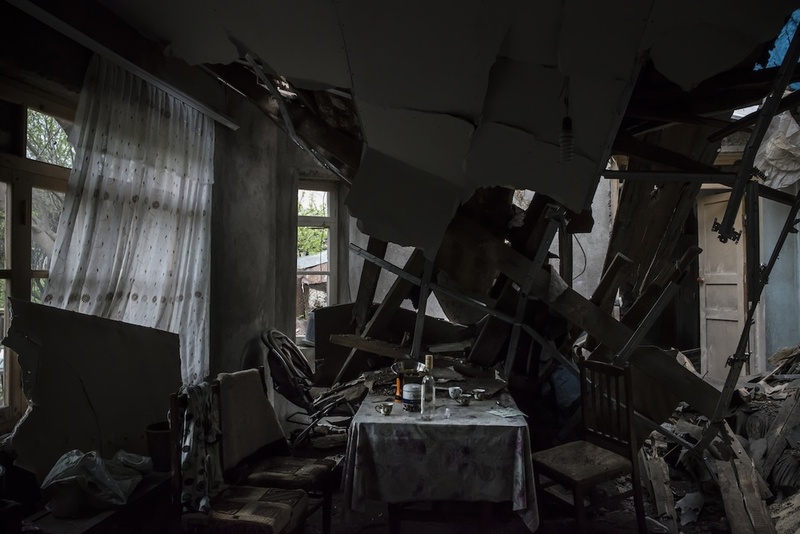 “The shootings began in the direction of the [Talish] village at night," Hermine Sahakyan, 30, says," We ran out of the house at 3:30 AM.” Later in the evening of April 2, around 5:00 PM, a shell hit their house. Another one hit the same house on April 5. 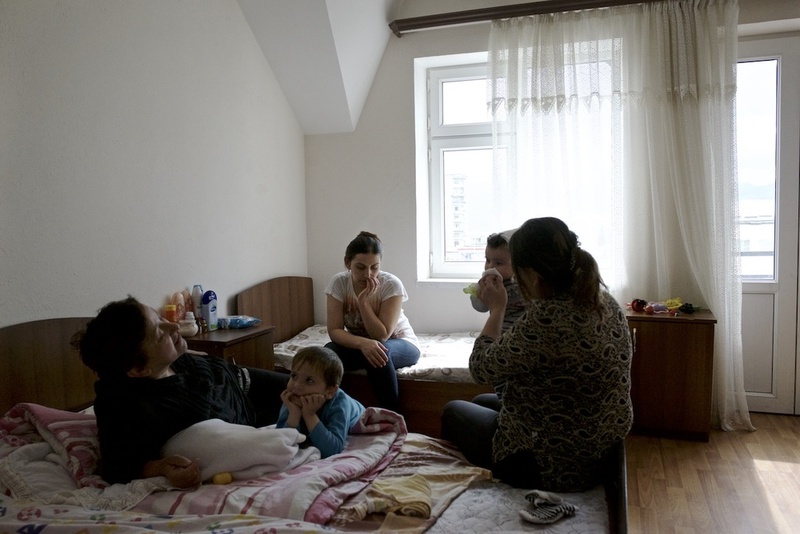 The family of Hermine Sahakyan, 30, (in the center of the frame) receives free accommodation and food at a hotel in Stepanakert. Her family house in Talish village was destroyed by shells. Frontline village Talish suffered severely from the re-ignited conflict. Villagers were forced to leave their houses, and to leave their animals unattended. Soldiers repair the phone lines at Mataghis village military post. The lines were damaged on the days of the fighting. At fire positions right on the frontline, a soldier arranges guns. Soldiers at frontline positions are often those serving their two-year military service, who happened to be at the positions as the conflict escalated. A road that leads from the capital of Nagorno Karabakh, Stepanakert, to the border with Azerbaijan. Visits to Nagorno Karabakh have been like light trips to the land of gorgeous nature in the last several years. But pain is always felt here. And for many years it has not been felt like in these days of fighting. 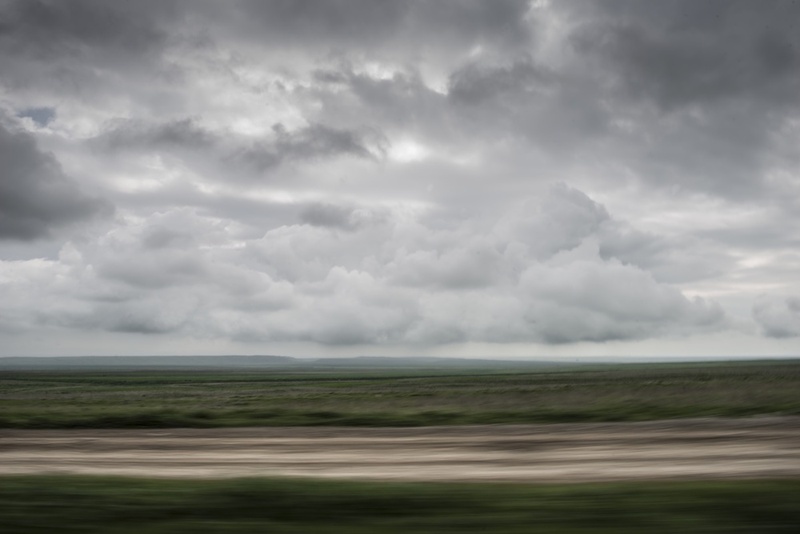 In this land, a disputed border region between Armenia and Azerbaijan, pain mixes with decisive character, one that is desperate to be recognized. Clashes between Azerbaijani forces and ethnic Armenian forces of Nagorno Karabakh escalated to a great extent in the night of April 1-2, 2016. More than 100 soldiers, on both sides, and several civilians were killed as results of these clashes. After several days of war, ceasefire agreement was announced on April 5th between Armenia and Azerbaijan. 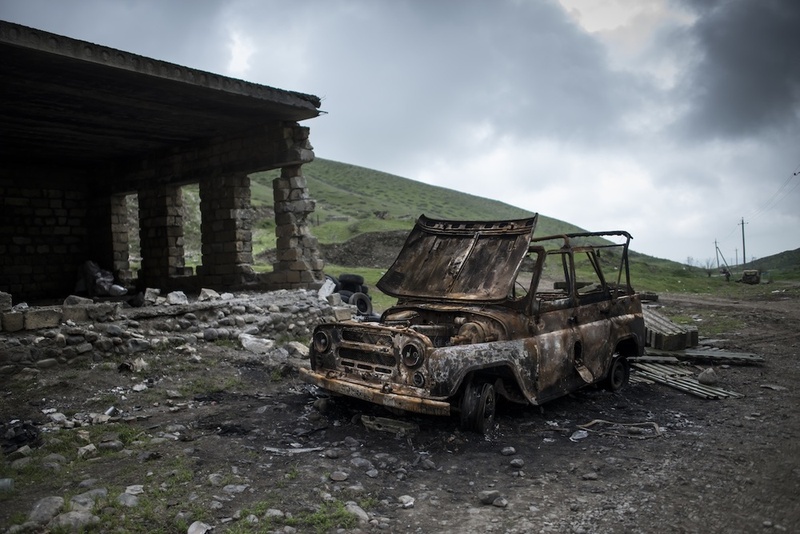 The conflict re-ignited more than 20 years after the war between Nagorno Karabakh and Azerbaijan, in 1988-1994. Up to 30,000 people were killed in this conflict. The ethnic Armenian enclave declared its independence from Azerbaijan in 1991, but the independence has not been recognized internationally. A ceasefire agreement mediated by Russia was signed in 1994 and stopped the war. But skirmishes along the border have continued for years. While sides are negotiating in a ceasefire and there is no clear picture of how things will develop, the spirit of Karabakh and its people is heavy. The word Karabakh means Black Garden, and the beauty of this garden is living its dark years.